Every now and again, I get so emotional about an event that I am forced to restrain myself from blogging. Graduating. It happened to me almost two weeks ago. Some would even argue I made it happen. I accomplished it. I'd rather not take responsibility for an event so traumatizing. Four years ago, I wouldn't have guessed that graduating would be such a painful process. As a freshman, I contemplated transferring to Columbia or NYU. I viewed my new friendships with floormates on D6 with suspicion and was repulsed by the preppiness of many of my Georgetown peers. My cynicism, however, could only withstand so many good times. My love of Georgetown grew to epic proportions with each basketball game, group dinner at Leo's, and covert dormroom pre-games. 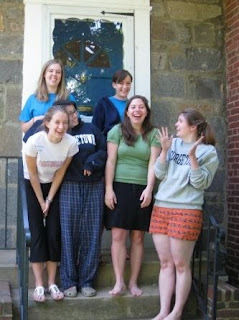 Four years later, I found myself living with five of my closest friends in the greatest house in all of Burleith (see photo above). It truly was a home with everything that a home should have: a family, good food, good conversation, and comfy couches. It was not unusual for at least one housemate to be awake between the hours of 6AM - 4AM. Consequently, round the clock moral support, as well as delicoius baked goods, were in constant supply. After graduation, I was the last housemate to depart our Burleith paradise. I braced myself for each of five "goodbye's" and though I knew I'd see everyone again, I cried. It was the dismantling of our family. The drama of it all was emphasized by empty rooms and white walls. Surprisingly, it became easier when everyone left. My anxiety floated away, and I felt like I could finally rest. Maybe because I had tried so hard to stay up late and wake up early hanging onto every moment while everyone was still here. The sadness of leaving the house behind lingers with me. I am living only a block away now, but it's hard not to remember how great it was as I walk by each day. Now is different, I tell myself. But different is not as good as before. I was lucky to have experienced such an amazing senior year and overall college career. I know that I am lucky, because when I tell people how hard it was for it to end, some can't relate. They can't identify with the feeling of loss. Graduation may be the most traumatic thing I've gone through, but I think that means I've had a pretty good life so far. Moving on isn't all bad. I do feel accompished, and I am excited to see how I'll turn out. Will I be successful? Will I move somewhere new? What will my first apartment look like? I'm excited to see how friends turn out too. What will they be when they grow up? I think the Class of 2009 thought it would have a clearer idea by now, but the economy has us on our toes. While I wait to find out, I've got some exciting plans for the next 4 months. In addition to a few jobs to keep me busy, I'll continue writing this blog. I'll write more music. I'll listen to more music. I'll even read. Unfortunately, Suze Orman is high on the priority list. As a grown-up blogger, what will I write about? I'll figure it out soon. Thanks for reading.